For a couple of weeks this season the Hanford Falcons sat at the top of the MCC standings by virtue of their victory over Chiawana. They put up gaudy numbers with their prolific passing game, which generated plenty of hype along with a league leading 310 points (that's 38.75 points per game coming into the final against Richland). This Falcon squad was touted as one of the best they've ever put together, if not the actual best. The Richland Bombers never quite reached the pinnacle due to their rocky, injury-riddled start to the season, and that meant they came into the final game of the season as underdogs, hardly expected to compete by casual observers. Those who have watched the Bombers this year knew better. Featuring the best offensive and defensive lines in the MCC, the Bombers are not to be taken lightly, and quickly showed Hanford that their best was good, but not quite good enough with a 34-24 win that moved Hanford from second in the standings to fifth, although they captured the third place spot for 4A teams, beating out Walla Walla and Pasco for the final playoff spot. The Falcons' first offensive possession foreshadowed the rest of the game. Kade Powell had a sack on the second play, Hanford made a couple of big plays, Daniel VanGorkum and Geoff Robinson had sacks on consecutive plays, and then Hanford punted from the Richland 40 on fourth down and 32. The punt was a good one, rolling out of bounds at the five yard line, but Dhaunye Guice and his offensive line got the Bombers easily out of danger with runs of 16, 8, and 15 yards. Sam Stanfield, less dynamic than Guice but more North/South, got a couple shots at running the ball near midfield, plowing a Falcon linebacker into the well-worn Fran Rish grass in the process. 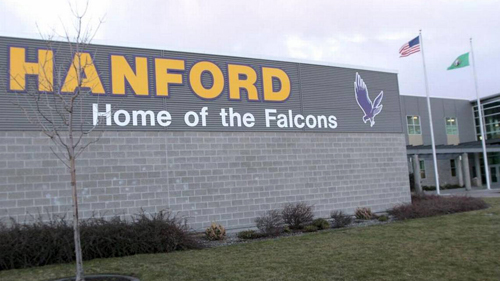 A couple plays later Josh Fonner, a starter at QB for Hanford as a freshman, took the snap from the 35 and spied Ryan Kriskovich streaking toward the endzone. Threading the needle perfectly between two defenders, Krisko took Fonner's pass at the 15 and darted two steps to his right, causing the defenders to collide. Leaving those two in a small pile, Krisko made for the endzone to put the Bombers up 7-0 with four minutes left in the first quarter. Hanford responded quickly with their bread and butter short passes, and tied the game with less than one minute to go in the quarter, but not without the help of a late hit penalty that brought them inside the 10. Richland responded with a 15 play drive that took them into the redzone, but a tipped pass fell into the hands of a waiting defender who returned it to the 25. The next 14 plays took the Falcons down the field using mostly the run, having apparently solved the puzzle of how to run on the Richland defense. It should be said that, starting in the first quarter of the game against Kennewick, Richland was in the middle of the sixth consecutive quarter without having a hold called on the opposing offensive line. Hanford went ahead 14-7 on a short pass across the middle, leaving the Bombers 2:10 to gather themselves and make something happen. They didn't need nearly that much time, using a five play drive to get Krisko into the endzone again, with the same play as the first touchdown. Another thread-the-needle pass from Fonner was caught by Krisko at the 20, who dodged more tacklers (who collided and fell in a heap again, coincidentally) and outran the rest to tie the game at 14 as the half ended. Richland's first possession of the second half ended with a 4 yard touchdown catch by Cody Sanderson after an eight play drive, which featured more Guice maneuvering and a 23 yard catch by Kriskovich. A sack for an eight yard loss by Camron Ball and two incomplete passes frustrated the Hanford offense, so they settled for a field goal to make it 21-17. When you're trading touchdowns, field goals are deadly. Starting at their own 10, Richland used short runs and short passes, the longest a 13 yard catch by Stephon Sanders, to get to the 30. From there, Fonner saw Ben Fewel on the left in single coverage. Quite honestly, Hanford's secondary was a glaring weak spot in their defense, especially against the speed and strength of Richland's receiving corps. Fewel made space for himself easily, reeling in the pass at the 40. It was no contest from there as Hanford had no one who could match Fewel's speed. 28-17, and Richland had so far failed to score on only one of their possessions. The fourth quarter rolled around with Hanford still down by 11 points, but the Falcons ran a 20 yarder in to close the gap to four. Unfortunately for them that left nearly the entire quarter for Richland to respond. The game had been getting what could be called chippy since the middle of the third quarter, with knees to the neck of a Bomber defensive end, a glove stolen from Krisko on a PAT (really, a stolen glove), late hits, and plenty of words exchanged between the teams. Both teams incurred penalties for roughing the passer and multiple counts of unsportsmanlike conduct. Undaunted, the Bombers marched down the field with a good mix of running and passing, getting all the way to Hanford's three yard line. A formation penalty erased what would have been Krisko's third score, and the Bombers were moved back to the 18. That only meant more room to maneuver, and Drew Daves measured vaunted Hanford senior linebacker Gunnar Beyer—a former member of Richland's freshman team—and found him wanting as he ran straight down the middle and caught the backbreaker. 34-24 Bombers. On the ensuing drive, Richland players and fans experienced a rare event, and the excitement in the Bomber cheering section was palpable. In Bomber territory, the game officials saw and called a holding penalty on Richland's opponent. That moment brought an end to seven quarters of play without a holding call, but it didn't stop the Falcons' desire to win. Richland's defense forced a turnover on downs but the offense wasn't immune to holding calls of their own, which brought about their first punt of the game, a good 45 yarder by AJ Storms that was returned to the Bomber 40 yard line. All efforts by the Falcons to salvage the game were futile as the Bomber defense locked down and forced the clock to run down, closing out the game at 34-24. Hanford had prospered all season with their short passes, covering the fact that their pass and run blocking weren't as good as their plethora of passing yards would indicate. The Bombers put pressure on the QB all night, with an embarrassment of sacks registered by Ball, VanGorkum, Robinson, Powell, and Stanfield, and probably others (defensive stats were not available). The Bomber offensive line cleared lanes against Hanford's three man front easily enough for Guice to rack up 125 yards on 17 carries, and protected Fonner against the pass rush as he threw for 300 yards and five touchdowns while completing 22 of 26 passes. Richland's defense held Hanford's running attack to 114 yards for an average of 3.4 yards per carry, and allowed 250 yards in the air, which is a good amount but nearly half of what Hanford was used to registering. Richland's defense swarmed and hit hard, and the offense consistently knocked defenders backward all game. Credit goes to Hanford for scoring 24 points when the previous three years combined had scored only 14, but the toughness of Bomber football proved too much for them, and the all-time series improved to 13-1 in favor of the Bombers. Hanford travels to Spokane to take on the Gonzaga Bullpups in an effort to advance to the state playoffs. A win for them there could mean a rematch with Richland at some point, which would be welcome as far as Bomber fans are concerned. Rematches are a reality for the Mead Panthers this coming Friday as they come to visit for a second year. Will they be thirsty for revenge after their brutal 62-7 beating last year, or is the trauma still fresh enough that they'll fear the Green & Gold? To find out, the game must be played, and that happens Friday at 5PM at Lampson Stadium, the first of a double header with 3A Kennewick taking on Mt Spokane after. Show up and cheer! Hanford preview by Jeff Morrow in the October 26, 2018 edition of the Tri-City Herald. Story by Jeff Morrow in the Sunday, October 28, 2018 edition of the Tri-City Herald.